2. There are no separators in Fx57+, but CustomCSSforFx project offers a style to replace flexible spaces with separators. Well that certainly is one way of solving the separator line problem, though a little un-nerving whilst in the Customize panel. But till Mozilla re-introduces the Separator line, it will do nicely. Though strange even after I had removed your CTR add-on from FFQ57, the prefs.js file still made reference to the separator lines and therefore, I presume, still made them appear. As for the Restart button I will leave that alone for now. You never know someone may come up with some WebExtension code. Thanks again Aris. Pre your CTR add-on I used chromEdit plus to do all my customisations and then you made it extremely easy for all of us and your GitHub repository is carrying on that tradition. There are undocumented ways to get separators even without any add-ons or custom code. The browser preference browser.uiCustomization.state saves and loads the toolbar configuration and keeps items on it not available by default anymore. It also keeps items and positions of uninstalled add-ons in case you reinstall them, so they get their previous position. This can be used to trick Firefox into displaying separators, because they are technically still present, but only hidden from customizing mode. Open about:config and search for browser.uiCustomization.state. Copy and paste the string content into a text file. Copy the new string back into browser.uiCustomization.state and restart Firefox. Your previous browser.uiCustomization.state contained some separators added by CTR in the past and carried them over to Fx57+. Creating a new profile removed that prefs content, but it can be restored. Thanks Aris - customising the about:config, browser.uiCustomization.state did not work. BUT what did work was customising the prefs.js file and editing the browser.uiCustomization.state line. Where there was the entry "customizableui-special-spring**" I changed to "customizableui-special-separator** NOTE: doing it this way also updated the about:config entry. I had to do that as the original lines were way to thin and faint. So the below image is now what I have. Aris, is there any css code to hide the mobile bookmarks folder from the bookmarks sidebar? Your solution is even better. Adding flex spaces everywhere separators should be, editing prefs.js and using find&replace on flex spaces is really smarter. CSS code can not hide sidebar content. It can only change some icons or background colors. If you are using Sync "Mobile Bookmarks" appear everywhere. Hi, i would like to know if it's possible to reduce the font size of the URLbar in Firefox post 57? To be more precise, from the current default theme (photon), the only thing i would like to change is the font size of the location bar (and search bar) back to 12px. Is it possible? 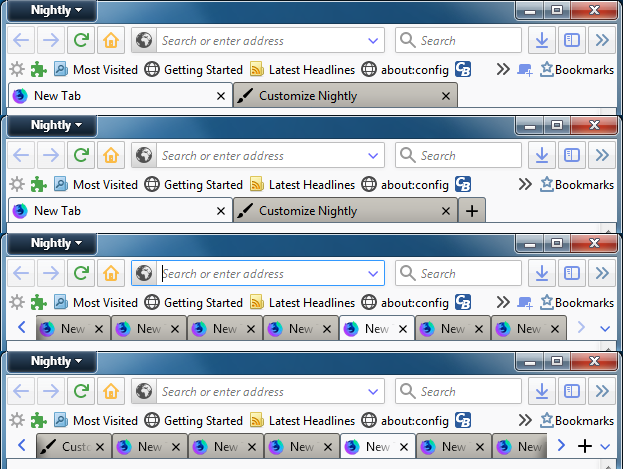 OTOH, it seems the code for getting the empty -dotted icon displayed on the tabs doesnt work on nightly 60. Make sure you also have the image file in the correct location. 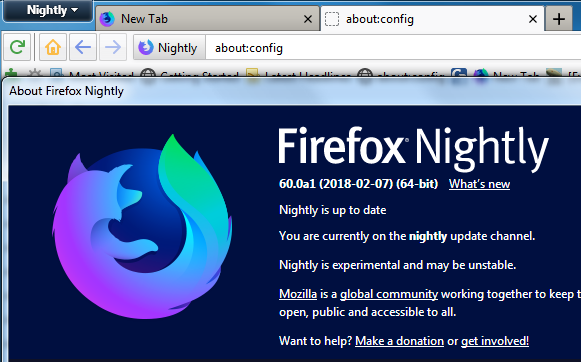 In the latest nightly using the "CustomCSSforFx 1.7.0." with the option "tabs toolbar below navigation toolbar" selected, the tabs toolbar height is too small. 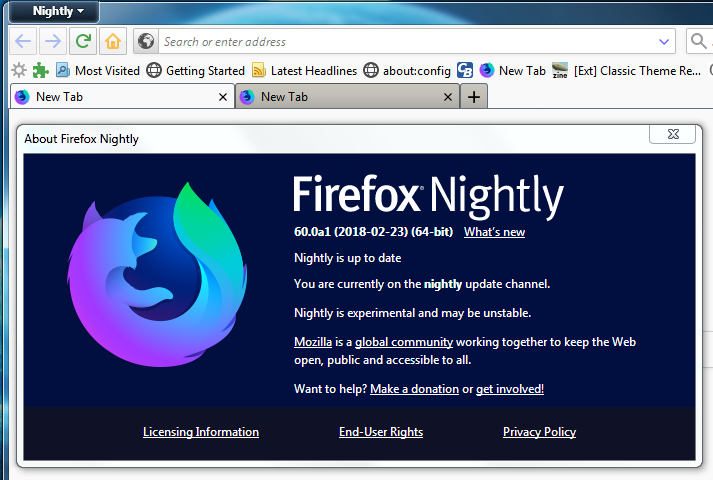 I´m using 02/02/2008 nightly and it works fine. Everything like always for me on Win7/10. 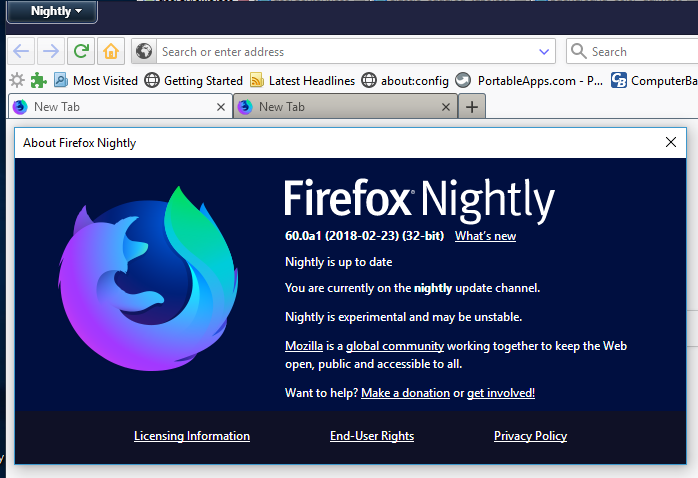 - I did install this add-on: https://addons.mozilla.org/firefox/addo ... dress-bar/ Now, the reload button has placed itself at the left side of the bookmark star and the history dropmaker (set to always show, at the end of the location bar). So it's (from left to right) reload - bookmark star - history dropmaker here. But I want the reload button at the very END of the location bar, so that it's bookmark star - history dropmaker - reload. Is that possible somehow? - Is there a way to make the font inside of EVERY tab bold? I don't want any other bold fonts in the UI, just in the tabs. 1. I did install this add-on: https://addons.mozilla.org/firefox/addo ... dress-bar/ Now, the reload button has placed itself at the left side of the bookmark star and the history dropmaker (set to always show, at the end of the location bar). So it's (from left to right) reload - bookmark star - history dropmaker here. But I want the reload button at the very END of the location bar, so that it's bookmark star - history dropmaker - reload. Is that possible somehow? 2. Is there a way to make the font inside of EVERY tab bold? I don't want any other bold fonts in the UI, just in the tabs. 1. "bookmark star - history dropmaker - reload"
This is not possible. The history dropmarker is not in the same box as the other buttons. You can either have it before or after all the other buttons. Aris wrote: Works fine here. I have the new tab button in the beginning of the location bar. If i put the new tab button on the tab bar the height is normal again. Could you test a clean setup of CustomCssfoFx files with only 'tabs not on top' enabled (compared to default setup)?